When ABC’s hit cop comedy Barney Miller first hit the airwaves in 1974, there was little else on television like it at the time. Perhaps the only series to which it could be justifiably compared at the time was CBS’ equally popular medical drama M.A.S.H.. None of the other crime-centered series at the time could be compared to Barney Miller and neither can any of the crime-centered series on television today. Taking that into consideration Shout! Factory’s recent release of Barney Miller: The Complete Seventh Season becomes another breath of fresh air that proving once more why Shout! Factory remains today the leading name in home entertainment. The seventh season of Barney Miller–the series’ penultimate season–is just as enjoyable as the series’ previous seasons. That is thanks in large part to the talents of the show’s writers. Once again, the writers have exhibited the highest caliber of talent, crafting scripts that not only balance the show’s humor and heart but also do so in a way that leaves audiences not caring in the least that each episode takes place entirely within the squad room. Another positive aspect of this season’s episodes is the work of the show’s cast. The cast’s comedic timing is spot on throughout each episode just as much as each member’s ability to handle the show’s more delicate moments. Being that each episode takes place entirely inside the squad room, one can’t deny the work of the camera crew. It’s a very limited set in terms of size. So it goes without saying that those behind the cameras exhibited just as much expertise in catching every bit of the squad room as well as the cast. By themselves, each of the noted elements plays a pivotal role in the enjoyment of Barney Miller in its seventh season. Together, they make this season another joy for any of the series’ original fans and for those today looking to escape the seemingly never-ending barrage of overly violent and overly sexualized cop dramas on television today. They also combine to exhibit once again just why Shout! Factory justifiably retains the title of the leading name in home entertainment. The seventh season of ABC’s classic cop comedy is one of Shout! Factory’s best new releases so far this year. The series’ penultimate season, it offers plenty for audiences to smile about beginning with the most important element of all, its writing. The series’ writers have once again crafted an entire season of episodes–twenty-two episodes in this case–that expertly balance the series’ humor and heart. That ability to balance the show’s humor and heart is exhibited right from the season’s two-part premiere “Homicide.” Barney and company have to deal with their usual crop of cases, including a bizarre case in which they have to hunt down a hitman hired by a woman to kill her husband. It’s not quite what audiences might think. The search is on after the woman in question actually comes to the squad in hopes that they would find him as she changed her mind about having the man carry out the crime. Both the case itself and its outcome will leave audiences laughing. It’s nice to see the lighthearted take on what would otherwise be a mega-event for so many of today’s unnecessarily overly dramatic and violent crime-centric series. It’s such a welcome change from those series comparatively speaking. The wildly entertaining “Rainmaker” is another excellent example of the writers’ continued ability to balance humor and heart in this season of Barney Miller. This episode sees an alleged rainmaker brought in to the squad room after he had lit a fire in one of the city’s busiest areas, only to find out that he had in fact been hired by the city’s department of water to try to make it rain. Interestingly enough research proved that he had in fact been hired by the city to try to make it rain just as he claimed in his arrest. What happens from here won’t be revealed. But it will have audiences laughing. It could be argued that what happens from there makes this episode a lightly veiled commentary about the behaviors of those that run America’s cities and the country in whole. Anyone not laughing throughout simply has no sense of humor. If that isn’t enough proof of the writers’ abilities, then the two-part mid-season story “The Movie” will definitely show it just as clearly as any of the season’s other episodes. This episode sees Harris having to put together a fake adult film in order to infiltrate the city’s prostitution Harris ends up going thousands of dollars over budget in the process. He also ends up making something akin to an art film instead of an adult film, leaving his fellow squad members and others in attendance for its viewing in complete disbelief. It’s an approach that had never been used before in any crime-centered series and has never been used since again showing just how talented and brilliant this series’ writers were and remain by comparison to those running today’s crime-centered series. As a side note, audiences will find interesting that writer Reinhold Weege actually uses the name of Harris’ made up film company–Starry Night Productions–for his own company, which would later produce the equally iconic legal comedy Night Court. But that’s a story for another time. Getting back on track, the episodes noted here each exhibit in their own way the writers’ continued ability to balance Barney Miller’s serious and not so serious issues in a way that will entertain audiences in so many ways. They are just a few examples of that talent, too. The other nineteen episodes that much up Season Seven each exhibit the writers’ talents, too. All things considered the twenty-two episodes that make up the seventh season of Barney Miller clearly exhibit the continued ability of its writers to leave audiences laughing and to move them all while keeping most of the show’s episodes within the tight confines of the squad room. The work of Barney Miller’s writing staff does so much to make the series’ seventh season a joy for both the series’ original audiences and today’s older audiences. From its light-hearted commentaries to its sometimes more zany plot lines, the writers’ are to be commended for crafting twenty-two more episodes that remain as hilarious today as they were so long ago in their original run on ABC. As entertaining as the writing makes this season, one would be remiss to ignore the work of the series’ cast in interpreting each episode’s script. Whether in its more lighthearted moments or its slightly more serious moments, the cast is spot on with its collective talents throughout the season. “Lady and the Bomb” is one of the best examples of the cast’s ability to interpret this season’s scripts. This episode sees a woman upset over her husband’s impotence (yes, his impotence) take the squad hostage with a pressure cooker bomb. She claims that radioactive medical waste at one of the city’s hospitals is to blame for his inability to perform. The very concept of someone taking such drastic measures is serious. The actions of both the woman and the squad members to the situation will leave audiences laughing just as much as their reaction when the woman’s husband reveals that maybe it wasn’t the medical waste in question wasn’t to blame for his performance problems. In any of today’s crime-centered series, the acting would have been just as over-the-top as the show’s scripts. But in the case of this episode, the work of the cast and writers together makes it one of the season’s best episodes overall and one of the best examples of how the cast’s work makes this season so great. The season’s two-part season premiere could be argued as good examples for the cast’s talents, too. The season’s other episodes each exhibit the cast’s talents in their own respective manner. There simply isn’t enough space or time to go into detail about how each one does this. Needless to say regardless of which episode(s) one chooses, audiences will agree that those talents are displayed in every one of this season’s episodes. And partnered with the continued solid work of the series’ writers, proves even more why this installment of Barney Miller is just as enjoyable as its previous seasons and why any fan of the series will want to add to their own home DVD library. 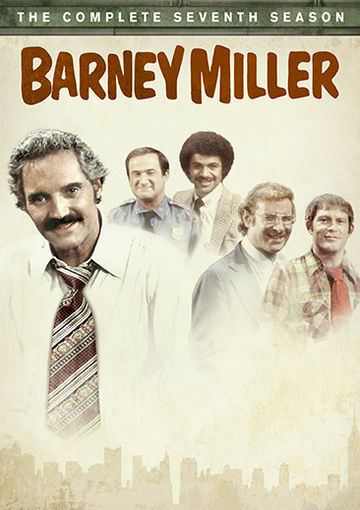 The work of both the writers and cast in the seventh season of Barney Miller more than makes this stand-alone season set a worthy addition to the home library of any o the show’s fans. They are both key elements of the season’s success in their own right. And as important as they are to the whole of Season Seven, the work of those behind the cameras is just as important to the show. Audiences must remind themselves that the set used for Barney Miller was not that big. And throughout the course of the show’s eight seasons on the air, writers only took the series out of the squad room a total of thirteen times. Of those thirteen times, only one of this season’s episodes took the show outside the squad room. Considering that this series was a multi-camera series and the squad room set not being that large, it meant a lot of tough decisions on camera placement. Luckily those decisions led to the director and camera crew catching every bit of the set without getting in the way in the process. There’s something about the camera crew’s work that makes the look of the squad room so much more believable than those of today’s crime-centric series. That ability to make audiences suspend their disbelief if only in terms of the show’s look is just as important to the show (and this season in particular) as the work of the show’s cast and writing staff. It makes this season all the more enjoyable or fans new and old alike. And when set alongside the work of the show’s cast and its writers, it shows clearly why this latest collection of episodes is just as enjoyable as the series’ previous stand-alone sets. The overall enjoyment of this set also serves once more as a reminder as to why Shout! Factory remains today the leading name in the world of home entertainment. The history of modern television is rife with wonderful, memorable series. Every genre has its own share of interesting programs. And then there are those that for whatever reason were not as memorable despite having their own flare. One of the shows that fits into that latter category is the short-lived political satire, Hearts Afire. This series, starring Markie Post and the late John Ritter lasted all of fifty-four episodes. It ran from 1992 – 1995, right around the peak of its more successful counterpart, Murphy Brown. It was likely the similarities to Murphy Brown that forced this sitcom to the curb. It could also be argued that while it did have its share of funny jokes, a good share of the show’s writing felt somewhat forced. Making things even more difficult for the show was the circumstances under which its cast came into it. These factors alone were enough to doom the show after just three seasons and make it disappear into the mists of television history. That is, until this year, when Mill Creek Entertainment resurrected the show in its entirety. Hearts Afire ran a total of fifty-four episodes over the course of its three seasons. In that time, it had its own level of success. Though, it never reached the level of its counterpart in Murphy Brown. CBS ran both shows in the network’s prime time lineup. This is where the trouble for Hearts Afire begins. Hearts Afire came along right around the peak of Murphy Brown’s run. It was pretty obvious the network heads figured if one show about a strong female news personality would work, then another would if a couple minor tweaks were made. Thus, Hearts Afire was born. The tweak with this show was that instead of Candace Bergen, Markie Post was introduced as a former news figure who works at a politician’s office. Post’s Georgie Ann Lahti is a strong female figure along the lines of Murphy Brown. And that’s a good thing. The problem is her character’s lines (and those of the entire cast). The show had its own share of funny lines in each episode. And the chemistry between Ritter and Post was solid. But for every truly funny line, there were just as many lines that felt forced. It isn’t subtle, either. It’s pretty obvious where the lines become are forced. This taken into account alongside the blatant similarities to Murphy Brown did a disservice to the show. The writing behind Hearts Afire was not terrible. But it was problematic. It caused some problems for the show. This problematic aspect aside, the show does deserve a certain amount of defense. The show’s casting came in under some difficult circumstances. The term difficult is not meant with a bad connotation here. Rather, it is meant more in the case of the actors already having established themselves in previous roles made making these new roles all the harder to portray to audiences who had come to know the actors in different roles. In the case of Markie Post, audiences already knew her as Christine Sullivan in NBC’s Night Court. And because he had not any major acting since the end of Three’s Company years before, most people knew him for the role of Jack Tripper. The only major acting that Ritter had done since then was the largely forgettable Problem Child movies in 1990 and 1991. This same kind of problem plagues so many actors to this day. Both Ritter and Post had both been pigeonholed of no fault of their own. The resultant effect was it made these new roles less believable to audiences that knew them for completely different roles. If audiences can take into account that both actors were trying to branch out into something different, that will make it easier to put aside beliefs about the pair’s previous roles. And with any luck, it will allow viewers to let themselves get past some of the show’s writing problems, too. Getting past both of these obstacles, viewers will find that Hearts Afire has its own charm, and is worth an occasional watch. 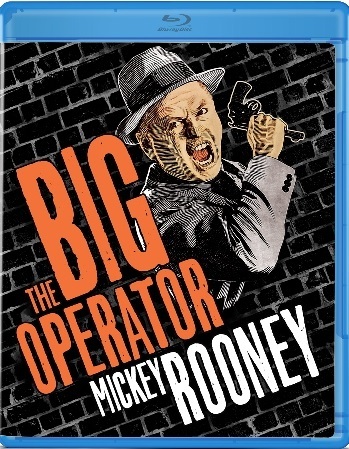 It is available now on DVD courtesy of Mill Creek Entertainment. 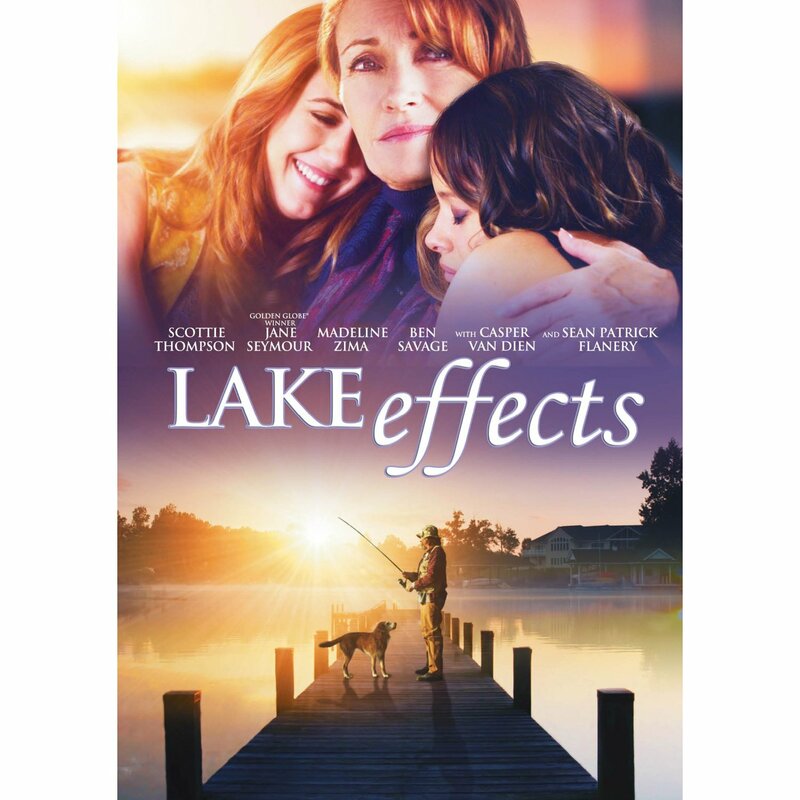 Lake Effects is a touching, heartwarming movie that is a good watch FOR any family. Anybody that liked Reese Witherspoon’s 2002 movie, Sweet Home Alabama will likely enjoy this movie, too. While the two movies’ budgets may have been far different, the stories are very similar. And as similar as they are, the general plots are different, at least. Lake Effects is very similar to Sweet Home Alabama in its general story. What separates the prior from the latter is that unlike Witherspoon’s character of Melanie, Sara (Scottie Thompson) didn’t leave her hometown to run away from her husband. In the case of Lake Effects, Sara left simply to break out on her own and experience the big city life. She does just that, becoming a lawyer at a major L.A. law firm. When her father unexpectedly dies, she is forced to return to the small town in which she grew up, and handle her father’s estate. At first though, she doesn’t even want to deal with the estate. It’s her sister, Lily, who convinces her to stay and help deal with the estate. This is where Lake Effects becomes even more similar to Sweet Home Alabama. As a result of staying in her old home town, Sara rediscovers her roots and even falls for an old sweetheart. Again, there is a pretty big similarity there between the two films. That similarity between the movies is also where another separation occurs. In the process of regaining her small town roots, Sara discovers a secret about her lake front community that becomes a center of conflict, which becomes her real biggest case, rather than the one she had to leave behind when she went back home for her father’s funeral. It also leads to the romance subplot that has its own similarities to the one in Sweet Home Alabama. It would be wrong to look at Lake Effects and call it original. There is no denying that it ripped off Sweet Home Alabama in a number of ways. For that matter, Jane Seymour’s attempt at a southern accent is anything but believable. For all the negatives, there’s no denying that for its intended female audiences, Lake Effect is a good movie for therapy. It reminds its audiences of the importance of family and of the little things in life. It serves as a reminder to never forget one’s roots. For that, it’s a movie that’s worth at least one watch. Court shows are all the rage today. There are almost as many court shows as there are re-imaginings of A Christmas Carol (ba-dumb-bump-bump…where’s the drummer when I need him? Oh wait, I’m the drummer!) Yes that was an intended bad joke. But I digress. If there’s one court show that stands out to this day over any other, it’s a little sitcom from the ’80’s called Night Court. Who out there remembers Night Court? My wife remembers it, too. I know that much. Well, the show’s fifth season is now on dvd. And anyone who’s nostalgic for worthwhile television will enjoy this season from what will always be one of the most underrated sitcoms of all time. Night Court’s fifth season sees Harry return to the bench, after having learned at the end of Season Four that he was not on the judge reappointment list. Not long after returning to the bench, Harry has quite the feats facing him. He has to council a suicidal man, and help Roz deal with her diabetes diagnosis. That episode in itself makes this season interesting in that it hasn’t been until recent years that diabetes has become a more openly discussed topic on television. So to that extent, the episode in question helped put Night Court somewhat ahead of its time. It also tackled the issue of equal opportunity employment in the episodes, “No Hard Feelings”, and “Dan, The Walking Time Bomb”. though to a certain extent, it could be argued that these two episodes were at least somewhat standard rather than standout. That’s because some shows in that time were tackling the issue of how people with disabilities are treated. While it set itself at least somewhat ahead of its time, Season Five also had its share of standard episodes. Among those episodes, it could be argued that “No Hard Feelings” and “Dan, The Walking Time Bomb” both were standard episodes. Other more common style episodes included: “Let It Snow”, “Death of a Bailif”, “Heart of Stone”, and “Mac’s Millions”. “Let It Snow” sees the gang getting snowed in the courtroom, thanks to a blizzard. It’s also tied in as a holiday episode. “Death of a Bailif” sees Bull “seeing the light” after allegedly hearing the voice of God. This happens after he’s struck by lightning on the courthouse roof. This is just a variation of episodes done by any number of other sitcoms. It’s still a funny episode. In “Heart of Stone”, one of Dan’s old flames comes back, and tries to seduce him. The catch is that she’s already married. Again, other shows at the time had done that. But it was still a funny episode. And Mac inherits two million dollars from his grandfather, leading him to leave. But his departure is short lived. Again, this is just one more variant on an episode theme that’d been done dozens of times before on other sitcoms. Regardless, it’s still a funny episode in its own right because of the episode’s execution. If the antics in the episodes aren’t reason enough to buy Night Court’s fifth season, how about the guest cameos? Season Five sees jazz great Mel Torme guest. Audiences also see Teri Hatcher well before she made a name for herself in Lois & Clark, and Desperate Housewives. There’s even a cameo by a very young Don Cheadle (Iron Man 2, Hotel Rwanda, The Family Man) in “Jung and The Restless”. Roz is forced to go to anger management class because of her attitude and behavior in the courtroom. Heck, even Johnny Carson shows up in one episode as himself. Night Court is, and always will be, one of the most underrated sitcoms in television history. The show’s first four seasons have already shown that. For those who haven’t discovered this classic sitcom yet, they’re a great addition to any comedy fan’s library. And so is the show’s fifth season. Whether it’s for the hilarious episodes, or even the cameo guest appearances from stars before they were stars, Night Court has shown yet again that no matter how many sitcoms come and go over the years, it will still be one of the best–albeit underrated–sitcoms of all time.